A Plank Road Publishing innovation. 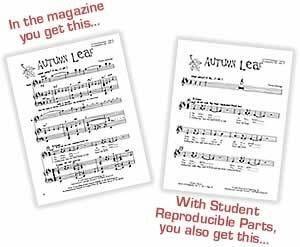 Student Reproducible Parts contain the extracted singers' part of every recorded tune in an issue for fast, less expensive photocopying. These parts are now available for all volumes, and, starting with Volume 19, are available in downloadable format, too. Single-issue print parts are available for just $5.95 each. What are the advantages of downloadables? With our combo option, you get the best of both worlds: a physical and downloadable copy of the Student Reproducible Parts. You will access your Downloadable Student Parts from your online account, so please log in before checkout. An account will be created for you automatically, if you do not have one. Subscribe now! If you have already subscribed but would like to upgrade to Downloadable Student Reproducible Parts, please call Customer Service at 1-800-437-0832. Electronic files, CDs and Student Reproducible Parts for Music K-8 will only be sold to customers who own the corresponding magazines, as it is the ownership of these magazines that conveys the use and performance rights for the music and materials found in them. Our usage and pricing policies provide the best values in the music industry for teachers and students, and we ask that you set a good example for your students by honoring them. If you have a question about our policies, please call us toll-free at 1-800-437-0832. Visit the Music K-8 magazine store page for subscriptions, back issues, and student parts. Read about the Current Issue of Music K-8 magazine.